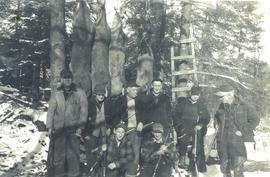 Photograph of Black River Hunt Club with member, long time Bradford resident Fred "Colly" Collings (on far right in photo). 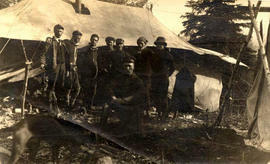 Appearing in Photo: Harold Scarrow, Percy Stephenson, Bill Melbourne, Bill Cover, Allan "Wink Crake", Fred "Colly" Collings. 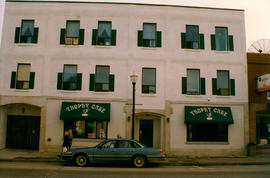 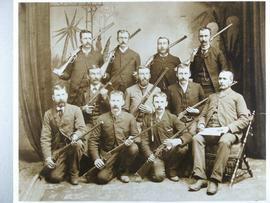 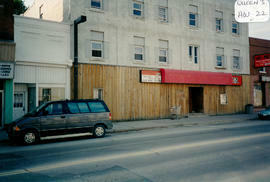 Photographs and other items related to the history of various hunt, rifle and gun clubs in the Bradford West Gwillimbury area. 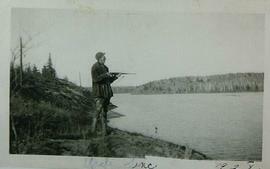 Sinc MacDonald with gun in 1928.